As a part of First Friday with the Arts, the Arts Council of Southeast Missouri held an opening reception for the exhibit of Missouri native Jean Rissover. 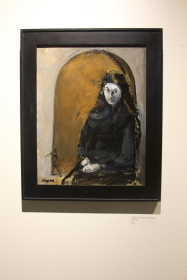 Her exhibit, “Distaff: The Lives of Women,” depicts the mundane and important part of women’s lives at various ages through the use of oil and acrylic paint. Rissover, who had been working on this project for about seven and a half years, wanted people to see how important women’s lives are and worthy of attention. “I greatly admire women who do great things, but everyday women, just all of us who are going to the grocery store and taking care of the kids either by ourselves or with a partner, those women’s everyday experiences are important. Attention should be paid,” Rissover said. In one painting accurately titled, “Selfie” there is a group of young women gathering close together as if to take a picture together. 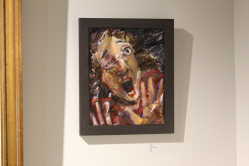 In another piece titled, “Fear” Rissover painted a woman with an intense frightened look on her face. Before painting, Rissover was a social worker in the St. Louis area. Working in that field she heard many stories of people she felt needed to be told, and after retiring she started to use art to do so. “A lot of the stories I heard have to deal with women and their life experiences and the various kinds of things that matter to women, and when I started painting that was just sort of what it was about. I was telling their stories, no models or photographs just stories in my head that I had heard from other people,” Rissover said. Some of her work is inspired by stories she has come up with on her own. She said these stories just come to her. “Some of them may resemble someone from my past, but most of the time they just come to me. Some of them have very short and unspecific stories, others are very elaborate,” Rissover said. Mary Chipman, a patron at the event, said she really enjoyed Rissover’s work and she could even relate to a painting or two. One she connected to is titled, “The Quarrel” where two women seem to be avoiding making eye contact with one another while sitting at a table. “The one of the two sisters seeming tense is something I instantly connected to, as well as a few others. There’s just so much emotion in the faces in her paintings. I love it,” Chipman said. Rissover also said her work is somewhat a response in disagreement to other artwork that is done about women, specifically that of Judy Chicago who made installations of original table place settings which the dinner plates resembled the genitalia of women. “I think it’s a little unfortunate that that’s what shaped the approach to art by women for women for a very long time. We are more than menstrual period and this is kind of a reaction to that,” Rissover said. Rissover’s work will be on display at Arts Council of Southeast Missouri, 16B N. Spanish St., until the end of the month.